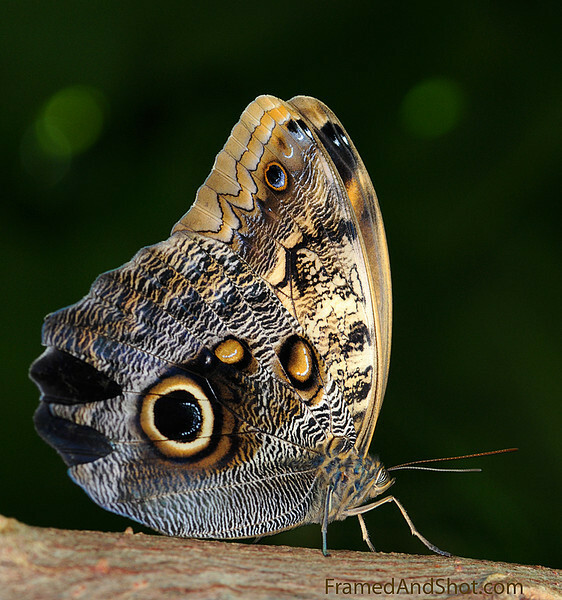 Giant Owl butterfly, [Caligo eurilochus] is a less colorful, but still very beautiful butterfly of which there are around 20 different species. They are one of the largest butterflies with a wingspan of up to 5 inches (12.5 cm). The common name is derived from the presence of large "eyespots" on the underside of the hindwings. To a human observer of dead butterflies pinned up in a collection, owl butterflies' underwings resemble the head of an owl when the butterfly is held head down. The eyespots are "false eyes" to scare smaller birds that attempt to prey on butterflies.